Electron Beam Melting (EBM) is an additive manufacturing technology based on a layer wise solidification of metal powders by selective heating and melting of defined areas using an electron beam. 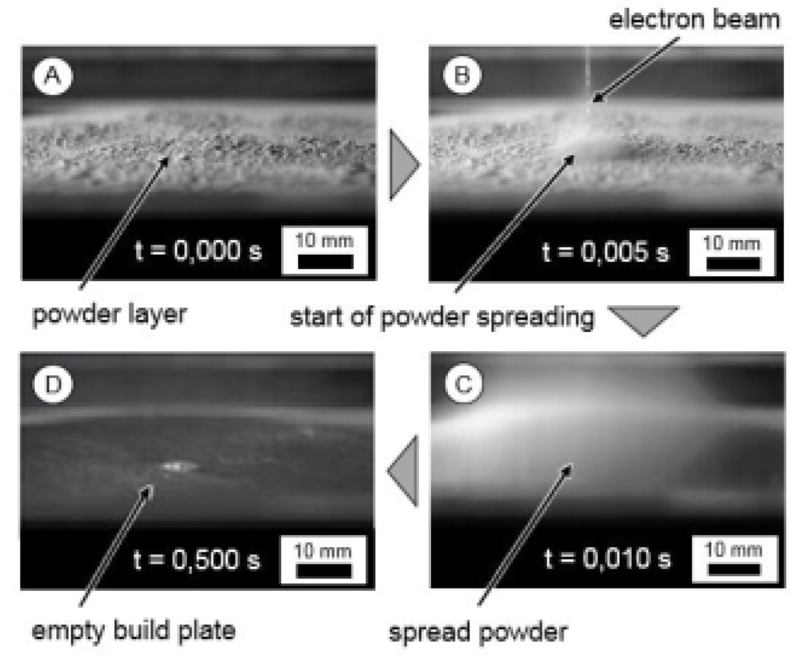 One of the challenges of EBM is powder spreading, also referred to as “smoke”, as shown in the Figure below. The smoke disturbs the generative process and leads to reduced build up resolution. Every single electron in the beam carries one elementary charge. The non-reflected portion of electrons accumulates their charges in the powder bed if electric conductivity is insufficient, leading to electrostatic charging and mutual repulsion of the particles. Currently preheating the powder bed is used to reduce the adverse "smoke" effect. Also a Helium atmosphere is used to prevent beam expansion. These effects reduce the economic efficiency of the process. The "smoke" effect can be reduced substantially by increasing the conductivity of the powder bed by the targeted application of a sufficiently high voltage to the powder bed, either directly by means of contacted electrodes or indirectly by means of electromagnetic waves inducing a voltage in the powder bed. The proposed invention is intended to replace both (preheating and Helium atmosphere), which would result in a significant reduction of the build time, lower energy consumption and a better resolution of the components. Additionally the post processing (e.g. cleaning of the component and removal of adhering pre-sintered powder) would be facilitated as well as the aging of the powder material reduced due to lowered build temperature. Feasibility has been shown. At TUM iwb Application Center in Augsburg a self-developed EBM system is operated, based on a pro-beam K6 electron beam welding system (Germany, Planegg). Several PhD candidates work on this system to increase process understanding and improve process stability.